Like the "Secret Menu Hacks" at Chipotle--just because you don't see something on a product page it doesn't mean that it isn't available if you ask. And our secret ingredient that you can add to any order is straps. Any size and any shape of carabiner we carry can be upgraded with one of our strap options. So then, what exactly are the different kinds of straps we carry? The standard strap is just the essentials. All of our straps are crafted from black woven nylon as the base. With the standard strap you get a loop on one end to attach to the carabiner and a split key ring on the other end to hold your keys. Simple, functional, convenient. The standard strap adds some distance between your keys and carabiner so that they rest better when clipped to a belt or bag. Our compass strap is essentially the standard strap, but with the added benefit of a directional compass. It has the same nylon base with split key ring attachment and includes a rubber loop mounted compass. These look very cool when paired with our camouflage carabiners and are great for outdoor enthusiasts. Not into camo? How about a boat shape carabiner--boats need navigation too. Undoubtedly the most spectacular and elaborate of our straps are the customized PVC straps. It's like the standard nylon strap, but with the addition of a custom molded emblem woven to the strap. Use up to 5 colors to create your logo/artwork on the 1.5" x .625" PVC emblem. The molded emblems can be used for a texted three-dimensional relief of your artwork. They are a real stunner. Add them to any carabiner order, or get them by themselves. Now you know about one of our secret-but-not-so-secret carabiner menu hacks. So will you be adding any straps to your next order? This entry was posted in Wholesale-Carabiners and tagged secret menu, hack, straps, wholesale-carabiners on March 6, 2019 by Wholesale Carabiners. 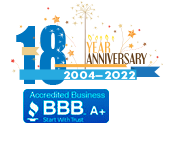 This entry was posted in Wholesale-Carabiners and tagged fonts, engraving, design, wholesale-carabiners on January 21, 2019 by Wholesale Carabiners. We all know and love carabiners for their multi-functional utility and ubiquitous appeal. But what do we really know about carabiners themselves? Let's take a dive into the world of carabiners to discover more information about their origins and how they became the beloved apparatus that they are today. 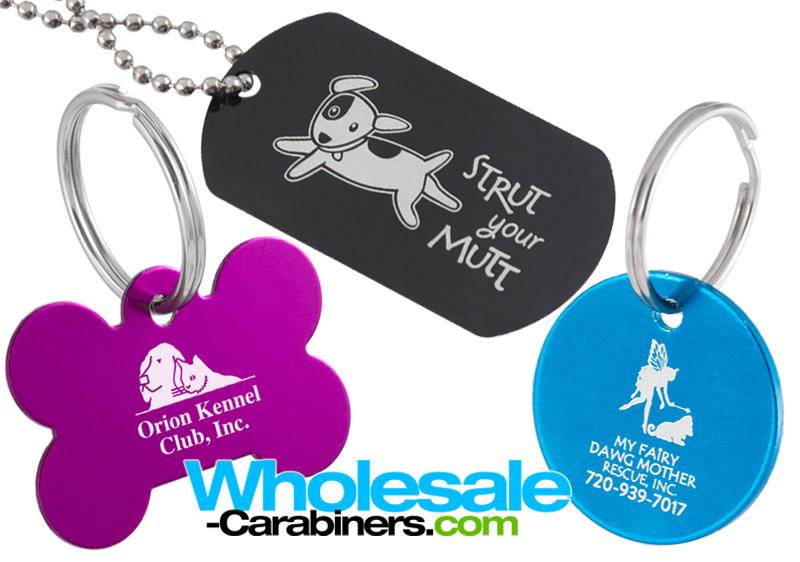 While we here at Wholesale-Carabiners.com specialize in supplying bulk quantities of custom engraved carabiners for use as keychains and promotional purposes, they actually have a more diverse history of applications. The name derives from the German term for "spring hook" which is Karabinerhaken. Further supplementing the etymology of "carabiner" is that the karabinerhaken were used during the Napoleonic Wars (1803–1815) by the carbine riflemen, aka "carabiniers" to attach items to their belts; with carabinier, itself, being a French term. Now, carabiners are used for everything from climbing, to scuba diving, to hot air-ballooning. While there are different shapes and styles of carabiner, they are all characterized by the swinging spring gate. Perhaps you've seen a similar item where instead of a latch there is a threaded sleeve to open and close the hook. These are actually called maillons. 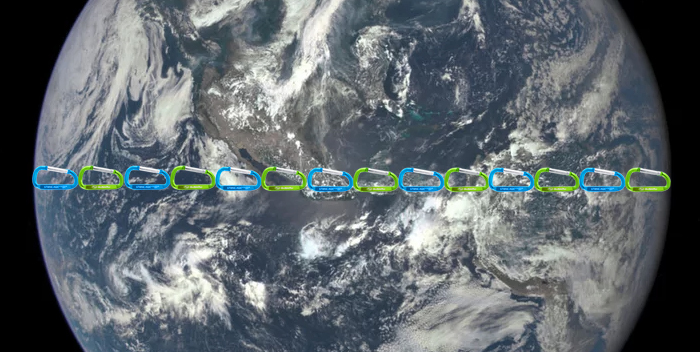 50mm - It would take approximately 801,500,000 of our smallest carabiner size to go around the earth. That's nearly three times the population of Brazil! 60mm - Only slightly larger in size, it would take about 667,916,667 of this size carabiner to engulf the circumference of our fair blue planet. Remember the hit 1995 movie "Operation Dumbo Drop" starring Danny Glover? The American National Standards Institution has set a standard for load bearing carabiners to support a static weight of 5,000 lbs in a fall protection system. Do you know what weighs, on average, 5,000 pounds? An adult male Asian Elephant. 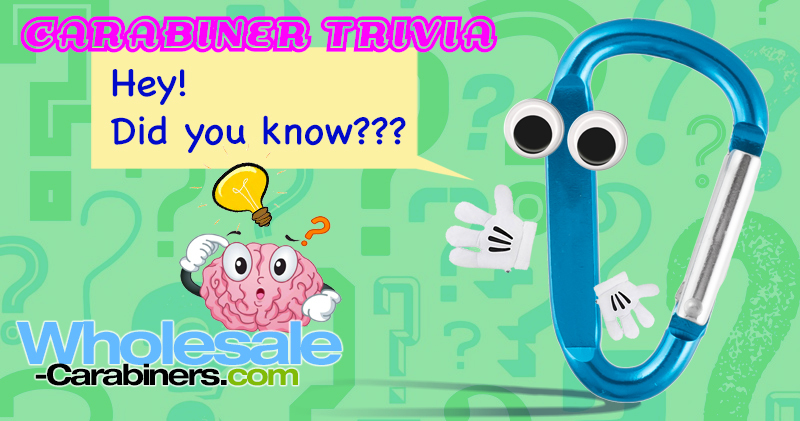 What is your favorite fact or trivia about carabiners? Please share in the comments! 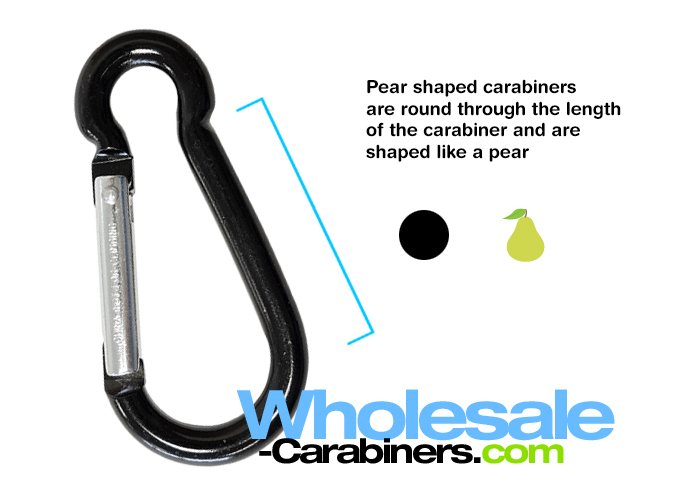 This entry was posted in Wholesale-Carabiners and tagged karabinerhaken, trivia, wholesale-carabiners, carabiners on January 4, 2019 by Wholesale Carabiners. Did you know that in addition to your logo or custom message, we can also engrave sequential numbers on your item? This is useful for people who want to track or serialize things. For instance, if you run an apartment complex you may want to give a unique identifier to each resident's dog to make sure they are a registered pet on the premises. Our bone shaped dog tags are great for this. Or perhaps you work in an industrial environment and want to identify machinery for routine safety maintenance. Check out our medallion tags for this use. Choose any starting number, whether you begin with 1 or 8392091748. Although, one caveat is that the increments must increase evenly by 1 as we cannot randomize numbers or use a specific set of numbers from a list. Use a number only, or add it to existing text or images. Please note that we do charge an additional setup fee and per item fee for sequential numbered engraving. These fees can vary based on your order, so please speak with one of our representatives to receive an accurate quote. This entry was posted in Product and Design, Wholesale-Carabiners and tagged numbering, sequential, engraving, wholesale, custom, carabiners on December 6, 2018 by Wholesale Carabiners. We have a great selection and variety of carabiners for all of your needs. From our small 50mm carabiners to our large 80mm patented Logobeener carabiners and everything in between our inventory has you covered. And with our collection of nine vibrant anodized aluminum colors you can achieve a style choice that matches your brand. We even carry fun non-standard carabiner shapes like stars, horses, houses, and more! But sometimes that's not enough. Maybe you need an in-between size or a very specific color. 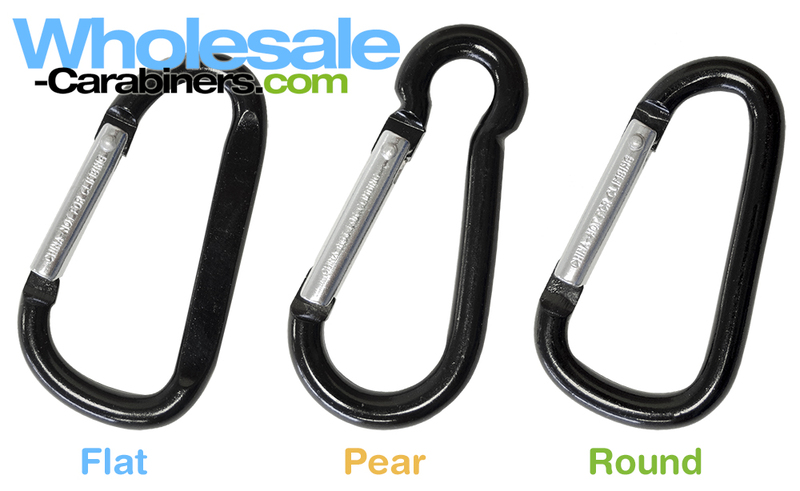 While we don't carry those in our regular inventory we can get you the carabiner that you need. 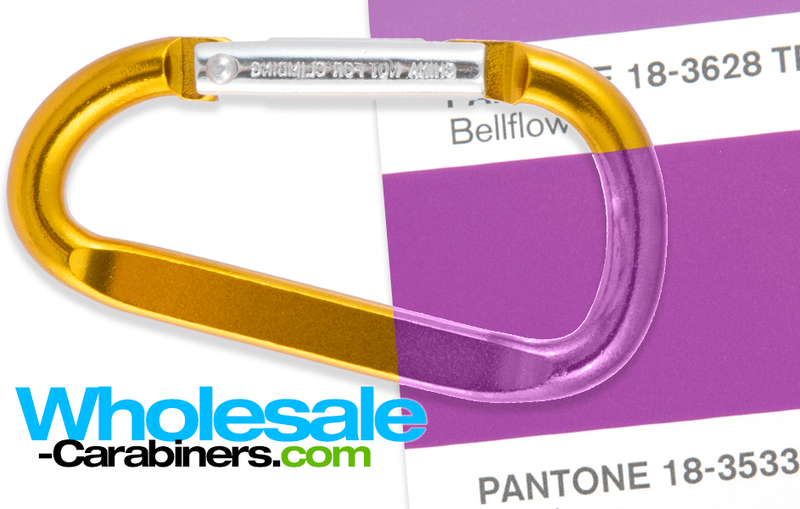 And we can provide a carabiner that is Pantone color matched for the ultimate branding solution. Add even more value with the addition of split key rings or rugged nylon straps. If you don't see what you need on our website, don't worry! Give us a call and see how we can provide the wholesale carabiners for your next project. 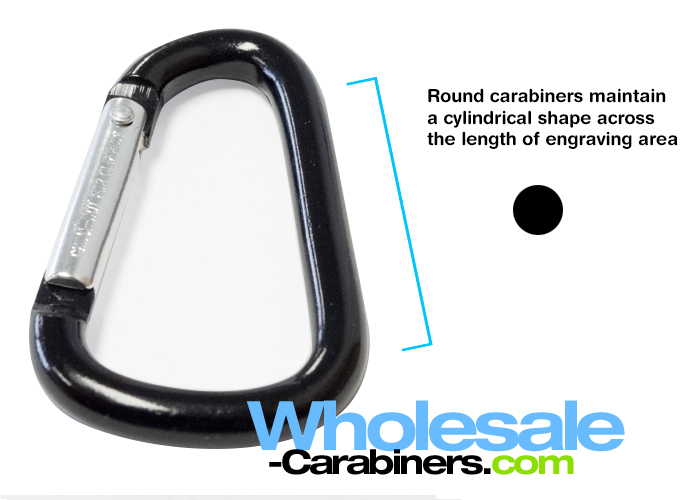 This entry was posted in Product and Design, Wholesale-Carabiners on October 18, 2018 by Wholesale Carabiners. Teachers: Are You Back-To-School-Ready For 2018? Cover your eyes, kids. This article is for the adults--specifically teachers and administrators. Summer has crested and while we're cherishing the dwindling days, we're also quickly approaching the beginning of a new school year. Have you starting thinking about what you need to get your classroom ready? While you're running around buying supplies and coming up with new ideas for the classroom, consider that now is a great time to look into having items custom engraved for your students. If you get a head start then there is plenty of time to refine your artwork and time for production and shipping so you can be sure you aren't crunching up against any deadlines. Our most popular items for schools are our engraved dog tags. We offer them in 11 different colors of anodized aluminum so we can match most school colors. Mix and match for the perfect combination. Dog tags ship with either rings or chains (your choice) and make for nice achievement awards, spirit trinkets, or even for identification / school passes. Carabiners are a good welcome-back gift for students too. Have your school name engraved on one side and the year on the other side. For even more functionality upgrade with a water bottle holder strap. Order now to beat the last-minute rush. Let us know what else we can do to help you get ready for a new school year filled with new opportunity. 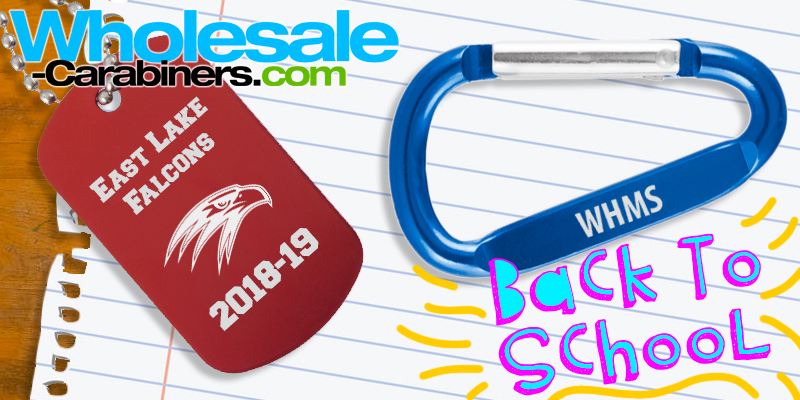 This entry was posted in Wholesale-Carabiners and tagged classroom, 2018, back to school, dog tags, engraved, carabiners on July 13, 2018 by Wholesale Carabiners. Do You Know About Our Round Carabiners? Most of the carabiners featured on our website are what we call "flat carabiners." These have a flattened engraving area that provides a level surface for a more consistent and reliable engraving. We want your artwork to look its best which is why we use these as our primary carabiners for your engravings. 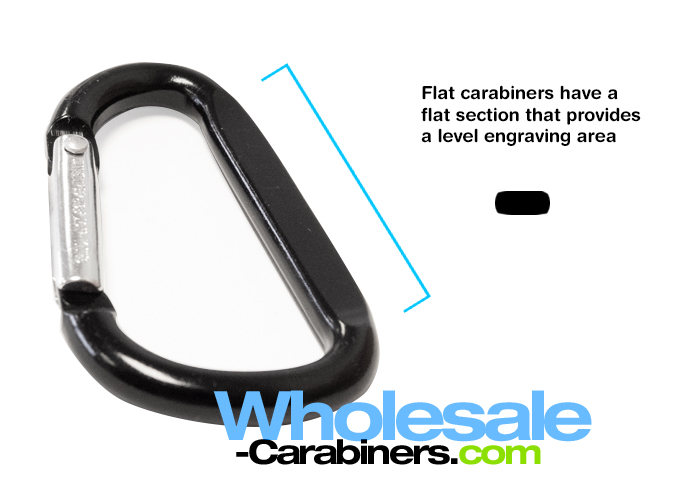 Plus, since the flattened area is recessed compared to the rest of the carabiner, your engraving will stay better protected from scuffs and scrapes. But did you know that we also offer round and pear shaped carabiners for custom orders? In addition to the round and pear carabiners, we can provide custom anodization using Pantone colors to match your brand requirements. Choose from any of our standard sizes for your order, or inquire about alternative sizes that might better fit your needs. Please note: Since these orders are provided on a custom basis they are not eligible for the same three day production as the rest of our carabiners. Please visit our main carabiners page for more information about the variety of carabiners we can offer you. We look forward to working with you to create the perfect carabiner keychain at great wholesale prices! This entry was posted in Wholesale-Carabiners and tagged pantone, pear, flat, round, custom, carabiner on June 13, 2018 by Wholesale Carabiners. 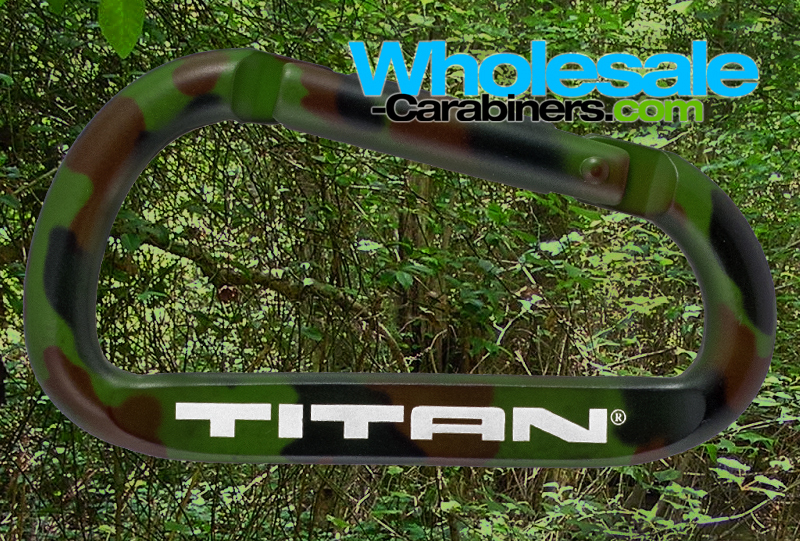 This entry was posted in Wholesale-Carabiners and tagged cool, camouflage, engraved, carabiners on May 17, 2018 by Wholesale Carabiners. What Style Of Dog Tag Works For You? You may be considering an order of engraved dog tags, but don't know which ones to choose. Let us help! Here's a quick overview our three popular aluminum dog tags. A good thing to note is that each style is available in any of our nine colors. These are the size and shape of the tags most commonly associated with the military. Unlike the military tags, though, is that ours are aluminum and are engraved, as opposed to stamped steel tags. An advantage to this style of tag is that it gives you the most engraving area compared to any of our other tags. With a larger surface area there is more room for your artwork. Another benefit of this style is that we offer it in two additional colors to our basic nine colors. If you want Pink dog tags or Camouflage dog tags, these are for you. Also, you have the option to order these tags with a black rubber silencer attached. We offer rings or ball-style chains with our dog tags, though we ship them in bulk so they will not arrive attached to the tags. Our Bone Shaped Tags are exactly what they sound like. Each dog tag is shaped like a bone--a popular choice for dogs. And these have a split key ring already attached so they are ready to go as soon as you get them. Similar to the Bone Shaped Dog Tags, our medallions arrive with a split key ring already attached so you are ready to go. With no corners on the round medallions there is nothing to snag or get tangled. And a circle is an animal-neutral shape so feel free to use these for cats or other purposes too! 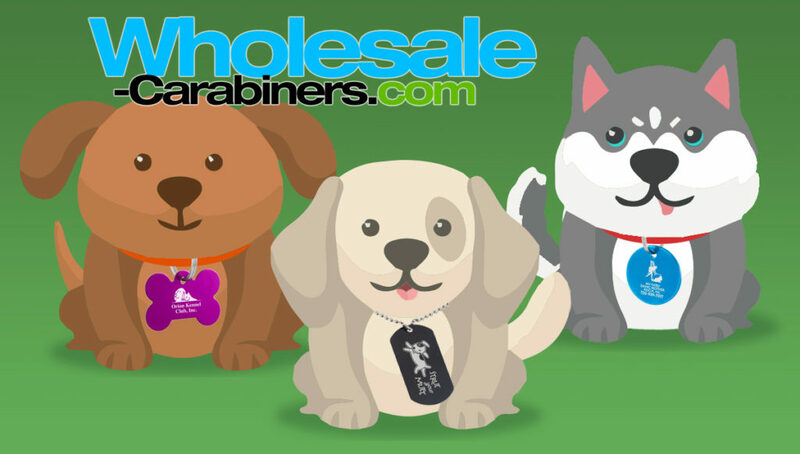 Please note that all of our tags do have a minimum order quantity as we are a wholesale website. If you are looking for a single engraved tag for your pet, unfortunately we cannot accommodate that at this time. This entry was posted in Wholesale-Carabiners and tagged medallion, bone shape, tags, dog, wholesale, aluminum, engraved on April 11, 2018 by Wholesale Carabiners. It's just a box with a triangle on top in its most reduced form. Add a chimney and you have an instantly recognizable and unmistakable shape. It's so simple that a kindergarten student can make a drawing that you would identify as a house. Yet for its simplicity, it is also a powerful symbol. The house shape is such a loaded icon. For some it represents comfort and security, a sense of belonging. For others it might represent a stressful financial responsibility or withering nostalgia. Buying a house is a major life event. But you know what? Buying 250 house-shaped carabiners is pretty cool too. Engrave each house carabiner with a message that will never fade. For instance, if you're a realtor you could have your name and phone number engraved on one side and a positive message on the reverse like "Welcome Home!" Then you could hand these out to your clients as you help them navigate the home buying experience. Or maybe you are a general contractor looking to expand your customer base. Your website would make a beautiful laser engraving on this house shaped carabiner. Keep a bucket of them in your truck so that you're always ready to let a new customer know about your business. We offer four vibrant colors of house carabiner. Pick your favorite. Mix and match. It's up to you! With one and two sided engraving available you also have the option to add split ring key rings to your order. Order more and save. Our already low wholesale prices get even lower when you order in bulk. Just imagine what you could do with 1,000 house shaped carabiners. 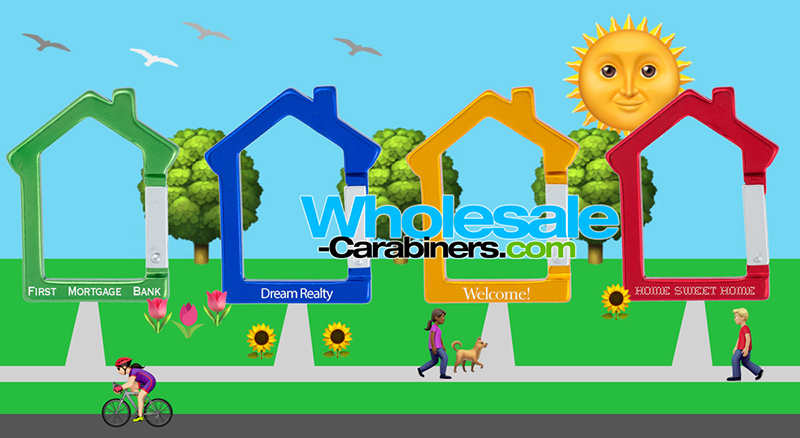 This entry was posted in Wholesale-Carabiners and tagged fun, house, shapes, wholesale-carabiners, carabiners on April 6, 2018 by Wholesale Carabiners.